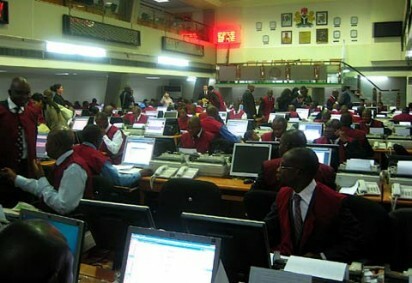 Activities on the Nigerian Stock Exchange (NSE) on Monday maintained the downward trend with the market capitalisation shedding N46 billion due to profit taking by investors. The market capitalisation lost N46 billion or 0.39 per cent to close at N11.756 trillion from the N11.802 trillion achieved on Friday. The All-Shares Index, which opened at 32,327.59, also dropped 125.61 points or 0.39 per cent to close at 32,201.98 following price losses by some blue chips. Nestle recorded the highest price loss of N20 to close at N1,350 per share. Guinness lost N1.90 to close at N86, while Mobil Oil dipped by N1 to close at N179 per share. GTBank lost 80k to close at N33.95, while Stanbic shed 75k to close at N41.50 per share. Conversely, Forte Oil led the price gainers’ table, gaining N1.50 to close at N19 per share, while Access Bank followed with a gain of 30k to close at N8.10. Zenith Bank appreciated by 20k to close at N20.25, while FlourMills added 15k to close at N19.15 per share. Access Bank emerged the investors’ delight as its 24.01 million shares worth N288.41 million were traded in 127 deals. GTBank followed with 23.69 million shares valued at N170.84 million traded in 216 deals, while Zenith Bank traded 10.32 million shares worth N781.12 million in 261 deals. International Breweries had 6.91 million shares valued at N195.59 million traded in 13 deals, while FBN Holdings transacted 6.91 million shares worth N57.28 million in 200 deals. NAN reports that the volume of shares traded closed lower as 160.67 million shares valued at N2.15 billion were traded in 2,935 deals. This was in contrast to the 252.19 million shares worth N4.73 billion exchanged in 3,120 deals on Friday.